Monday August 15, 2016. Phil ended up with blisters on his toes from walking so far and long in beach shoes the past two days. Path of our walk along the beach. It was lovely and cool so we had a quiet day. We took care of laundry, household chores, homework, and reading. Sandy picked up a few items from the Intra-Muros Carrefour city grocery store. It is very common to see dogs on the stairs or at the entrance to the store waiting for their owners to finish shopping. She was really surprised to see a mother cat and her two kittens peeking their heads out of their owners backpack which had been placed at the entrance to the store. The cats were a novelty to all of the shoppers as they stopped to see the cute animals. Tuesday August 16, 2016 was sunny and a high temperature of 25ºC. The wind was out of the north and was nice and cool. We shopped at the Intra-Muros marche for fruit and vegetables. Today we purchased “pastique” or watermelon. It made a delicious lunch! In the afternoon we spent some time at the harbor watching boats come and go. Since it was almost high tide, we watched some “idiot aged males” (as Sandy refers to teenagers) jump into the sea from the top of the basin. It was at least a 20 foot drop. There are many rocks and boulders below in the area where they were jumping, but fortunately for them, the tide was high enough to prevent any injury. Of course, they did feel the need to drop their swimming trunks to “moon” the passing boats and passengers. People getting ready to board the Corsaire ferry for the ride to Dinard. Loading the Corsaire ferry for the ride to Dinard. Corsaire ferry in the foreground and Condor ferry in the background. Wednesday August 17 2016 was sunny and cool in the morning. By the time we returned from Christine’s tutoring session it was warmer. The predicted high temperature was 29ºC / 85ºF. Our apartment did not feel hot but we kept the french doors and the awnings closed facing the sun while we were gone. We haven’t had any significant rain for over a month and we heard on the news that there are water restrictions in part of the country. After lunch the sun disappeared behind the clouds and the cool air continued to move in. Fortunately for us, we escaped the heat again today. Thursday August 18, 2016 was supposed to be cloudy all day. We took the 8:40 am bus to Carrefour at the Madeleine center to avoid crowds and do our shopping. We completed all of our shopping and were returning to our apartment on the 10:15 am bus. There were very few people around even in the Intra-Muros all morning. However, even though the weather forecast was for 100% cloudy, the sun came out around lunch time and was a beautiful day. We were invited to our friends Jean-Louis and Claudine’s house for dinner. Their daughter and her family would be joining us. Sandy had purchased a small picture book to take as a little gift to their petite-fille /grand-daughter who will be 2 years old next month. Usually Jean-Louis picks us up in his car when we go to their house. Today, we offered to take the bus now that we are better able to figure out directions, places, locations, etc. We took a bus from the Saint-Malo Gare to the Gare near his house. The trip took only 20 minutes and there were only 4 additional passengers besides us on the bus. It was a lovely evening, great conversation, and of course delicious food. It was the first time for Sandy to try moules (mussels). Claudine is an outstanding cook and Sandy doesn’t hesitate to try anything she prepares. The bus route stopped running at 19:30 so Jean Louis brought us home. Sandy did discover that we could return on another bus route that leaves from a different location at either 22:00 or 23:00. Jean-Louis was very kind to bring us home at midnight and we didn’t turn into pumpkins. In the morning, there was a car from Russia in the basin parking lot. Sandy eating moules (mussels) for the first time. Friday August 19, 2016 was drizzly and cool, only 15ºC when Sandy walked to buy our croissant and baguette for breakfast. Phil met our neighbor Jean for coffee at 10:30. When Sandy met them a little later it was raining hard enough to use an umbrella. We picked up prescriptions from the pharmacy and headed home. After lunch there were a few off and on showers, the sun came out and it turned into a beautiful day. Saturday August 20, 2016 is sunny and 17ºC when Sandy shopped for our breakfast. Today was one of the days of the Grand Maree where the coefficient of the tide is greater than 100. For more information on the grand maree: www.grandes-marees.com. The wind was very strong too, which is why Saint-Malo has the highest tide in Europe several times a year. We took our beach shoes to walk in the water two hours after high tide. As we approached Porte Saint-Vincent we saw the bus waiting and decided to take the bus to Rochebonne beach and walk back. When we arrived at the beach we could see that there was room to walk in the sand almost the whole way back. However, the wind was blowing directly at us, the waves were higher and the water deeper than we expected. Sandy would have been knocked down by the waves or blown down by the wind if she hadn’t been holding Phil’s hand. There were many people riding surf boards, boogie boards, and kite boards. We saw later where one of the hotels that faced the beach had windows broken out by the tide. Quite a spectacle to see and experience. When we arrived back to Porte Saint-Vincent, our calves were sore and we felt as if we had used many muscles on our return walk. The starting point of our walk along the beach. Beautiful day strolling along the beach. The waves making their way to shore. Sunday August 21 and we took a mid-morning walk to the Plage de bon Secours to look at the high tide (grande maree). A high tide (grande-marre) with waves hitting high on the breakwater. High tide (grande-maree) waves hitting the rocks at the base of the ramparts. Monday August 22 and we took the bus to the La Madeleine center. We were looking for covered toe sandals for Sandy. We went to Go Sport and InterSport, but neither had the correct size and color combination. Tuesday August 23 and it’s going to be a hot day, around 33 C which is around 90 F. We went for a walk on the beach, but it was cut short as the tide was coming. With the tide coming in we quickly ran out of beach to walk on, so we cut it short. It was still a nice walk and we got it in before the heat of the afternoon. Some different colored beans at the marche this morning. A seagull came to visit at the window ledge. Thursday May 26, 2016 and neither one of us shops for a baguette for breakfast. We had bread left over from yesterday. Sandy slept much better last night and so of course Phil was able to also. Sandy’s foot was slightly less swollen and she was not in excruciating pain. An improvement. 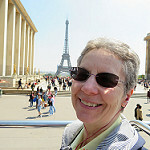 Phil left our apartment around 10 am with Jean our neighbor to shop at the Rocabey marché and Intermarche grocery store. However, Phil only came home with two items out of 20 on our list. He’ll take care of everything else tomorrow. Sandy enjoyed the warm air and sunshine sitting on the new chairs on our balcony while he was out. After lunch Phil went to the Carrefour City in the Intra-Muros for a few items. He bought salad and bread to have for dinner tonight with Coq au Vin. Sandy had made the Coq au Vin a couple of weeks ago and froze most of it. While going to the Carrefour Phil took this picture of the old Telegraphe-Poste-Telephone building. Sandy caught up on some sleep with quite a long nap, at least for her. She was awoken by thunder and lightning. The weather forecast for today was a high temperature of 21 C and disruptions caused by thunder and lightning. The forecast was true! Sunrise is now at 6:15 and sunset is now at 21:56 (9:56 PM). A lot of day light.